Those who call Pigtown home love its proximity to downtown, I-95, Federal Hill, the MARC train, and the stadiums. With a very involved community, Pigtown is growing rapidly and welcoming more and more new residents, businesses, and organizations. The Pigtown Historic District comprises some 36 city blocks lying in Southwest Baltimore, south and east of the Baltimore & Ohio Railroad yards. Developing initially as a community for railroad workers in the 1840's, along Columbia Avenue (now Washington Boulevard), Ramsay, McHenry and Poppleton Streets, the area grew rapidly to the south during the industrial expansion of the 1850's and 1860's. Small two-story houses were built for workingmen on the narrow streets running south of Washington Boulevard with three-story gable-roofed houses and then early Italianate house lining Washington Boulevard and Scott Street to serve as housing for shopkeepers and upper-level managers. Development of the Pigtown is intimately linked with hallmark events of the Industrial Revolution in Baltimore, particularly the growth and development of the B&O Railroad, the nation's first. In the 1980s, in an effort to reinvigorate Pigtown, the neighborhood name was officially changed to Washington Village. The true name of the neighborhood is still under debate. With the rise in property values and the influx of newcomers to city life in the late 1990s through today, Pigtown's population and quality of life has consistently risen. In the early 2000s, Pigtown was designated an Empowerment Zone, bringing new businesses and homeowners. This effort has continued with its designation as a Main Streets Community, which promotes Pigtown's eclectic business corridor. Recently, Baltimore's west side has been targeted by the mayor's office as an are of focus for major developments and investment, which will doubtless continue to grow Pigtown in value and quality of life. Today, Pigtown is a community of renters, homeowners, and businesses. Residents are socially, racially, and economically varied, making Pigtown one of the most diverse neighborhoods in Baltimore city. 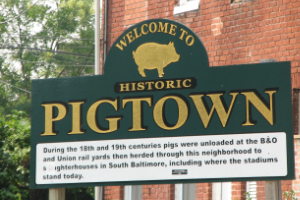 Pigtowners are very proactive in their neighborhood organizations, contributing to the continuing growth, quality of life, and improvement of Pigtown. Pigtown's energetic commu¬nity, diversity, value, growth, and GREAT location continues to attract new residents, businesses, and development.